If I’m being honest, typically the last week in the month is a bit of a free for all when it comes to “good habits.” Meaning, I tend to put off working out… pour myself a second glass of wine… eat another slice of pizza… because there’s next month to start over! I am the queen of fresh starts and clean slates. Usually- and I’m not exaggerating here – if I don’t start something on the first of the month, there is a good chance I’ll put it off for another 29 – 30 days. I have a friend who did a 30 Day Yoga Challenge (which I’ve done a few of myself) and she just randomly started on like the 8th or something. When she told me this, my mind just couldn’t comprehend. I could never start something so abruptly. I need a “fitting” timeline (like starting on the first of the month!). Structure (4 week milestones neatly lumped together on my calendar for easy reference and note taking). An end goal (what’s a better “end” than the end of a month or year?!). I’m not 100% behind these words just yet but I am getting better at not letting the need for “fresh starts” take such superiority. Even if it is against my nature. I really do like the idea of starting something new (or again, in most cases… eat better, drink less, move more…) at an appropriate time. My mind is run by timelines and To Do lists (don’t you want to be friends with me!?). 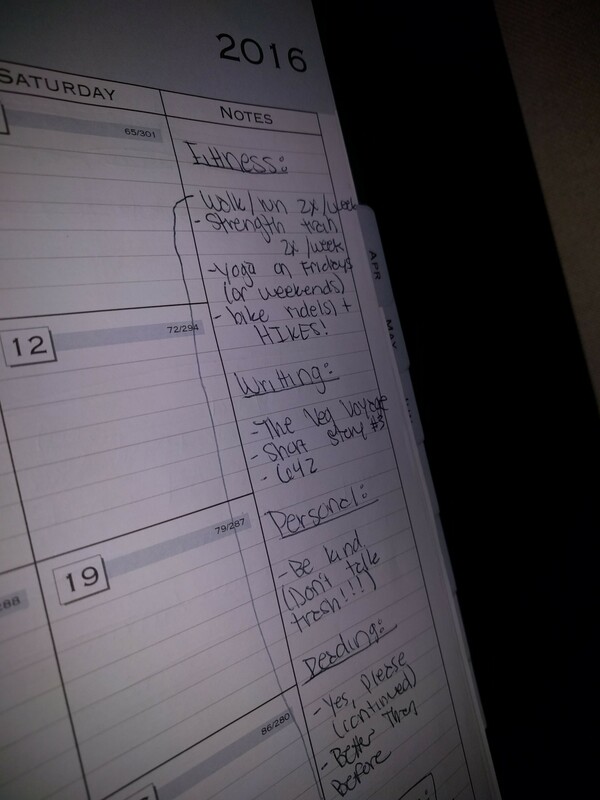 At the beginning of each month I sit down with my planner and write down my fitness, writing, and personal goals. Surface level, I would say this is a good habit. It keeps me focused for the month but doesn’t result in boredom because I am constantly changing things up. The trouble begins when … life gets in the way. Which, of course, it is BOUND to do. For example, this week I had planned to do the classic cardio and strengthen training combination everyday. And then I remembered I had a work dinner on Monday night. And I was invited to a work event Tuesday afternoon/evening. Two out of five of my workouts were already failures*. Typically, at this point, (PARTICULARLY because it is nearing the end of the month, the easiest time to let myself off the hook) I would have given up and resolved to start up again next week (or, next month). But, I’m starting to recognize that consistency is best; not having a “perfect” month. So on Wednesday after work, I laced up my shoes, grabbed the trash (trying to save time and a trip down the stairs by taking it out on my way for a run), and headed out the door. And then I dropped my keys with the trash in the dumpster. Luckily my neighbor was home and helped me fish them out but by the time we got them, Mike was home and we had to go pick up my car from getting some routine maintenance before the dealership closed. When we got home, I was getting hungry but I knew I had to do something. I headed outside again with the intention of running/walking 2 miles but by the time I was done with my 1st mile, I was ready to go in and start dinner. I figured 1 mile was better than nothing and decided to “make it up” on Thursday (today) and Friday. If I just did a 1/2 mile more each day, I would still come close to hitting my goal. Today I set out for my 2.5 miles and was hit by an allergy attack after my first mile! I tried to continue but I was sneezing and snotting everywhere (not cute). Another day of sub par exercise. To summarize, my goal for this week was to workout everyday. I got out twice and only did 2 miles. But I’m going to go out again tomorrow (it’s the 1st of the month anyway!) and the next day and …well, then it’s Sunday and I’ll probably sleep in then but you get the point. *I could have gotten up early and worked out in the morning but my success rate is pretty much 0 here so I didn’t even try.